The Overseas Development Institute (ODI) has just released a report on the eradication of poverty that includes an overview of existing work on projections of extreme poverty to 2030. Ending extreme poverty (defined as living below $1.25 a day 2005 PPP) by 2030 is a central part of the global development agenda. It is at the heart of the United Nations Sustainable Development Goals, the World Bank has made it a key goal and NGOs, such as the Global Poverty Project, are mobilising hundreds of thousands of people to encourage global leaders to achieve zero poverty by 2030. Before addressing this question directly, it is worth highlighting the historical significance of the goal. Extreme poverty was the common experience for most of human history until recent generations. Former World Bank Economist Martin Ravallion has estimated the historic reduction in the number of people living in extreme poverty in the developed world using data on income and inequality (see here). While it is difficult to be exact, he provides the best insight available into trends in poverty reduction, which are shown in the chart below. 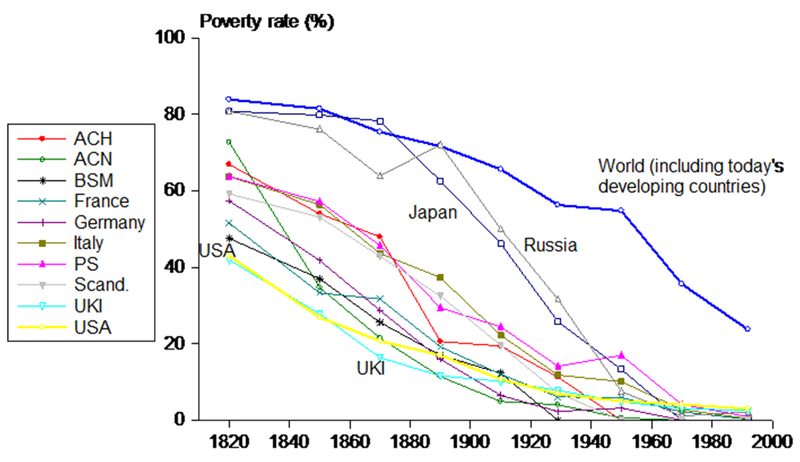 Source: Poverty in the rich world when it was not nearly so rich, Martin Ravallion. Note: ACN – Australia, Canada, New Zealand; ACH – Austria-Czechoslovakia-Hungary; BSM – Benelux-Switzerland-Micro-European States; PS – Portugal, Spain; UKI – United Kingdom and Ireland. In addition to the relatively recent elimination of extreme poverty in developed countries, extreme poverty began falling rapidly in developing countries over the last half century. The first Millennium Development Goal, to halve extreme poverty in the developing world between 1990 and 2015, was met five years ahead of schedule. If these trends continue, the world would seem to be on track to be free from extreme poverty in the foreseeable future. The best available estimates suggest that the world will come close to ending extreme poverty by 2030, but that there will still be more to be done. Most projections show that around 3–7% of the developing world population (around 200–600 million people) will remain in extreme poverty in 2030. 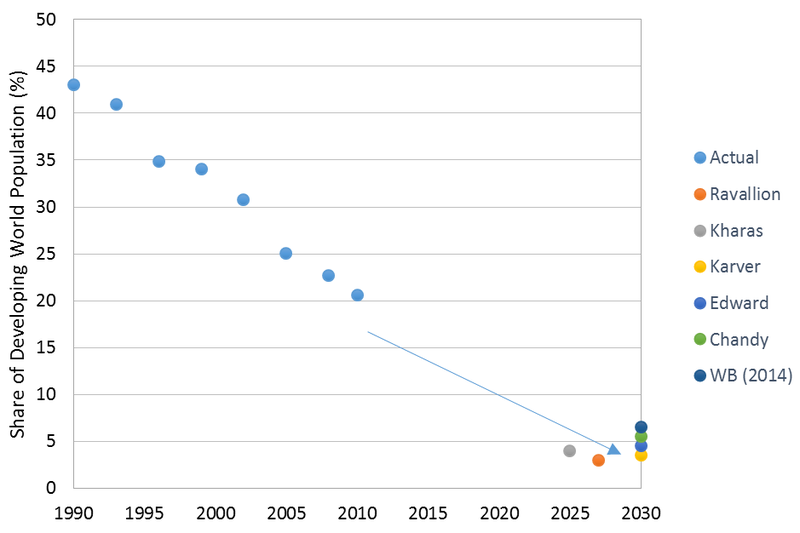 The projections in the ODI report, shown in the graph below, are based upon a ‘business as usual’ approach, whereby strong economic growth in the developing world continues as it has over the last decade or so, inequality remains constant, and the potential effects of climate change are ignored. Clearly these assumptions are simplistic. One of the authors of these studies, Lawrence Chandy from Brookings, even highlights that predicting poverty into the future is a ‘fools errand’ (see here). Yet these projections provide a helpful guide as to what the world is likely on track to achieve. Source: Data and links to underlying sources available here. A major shift of the geographical concentration of global poverty is expected to continue over the next 15 years. Since the 1990s the vast majority of the reduction in extreme poverty has occurred in East Asia, with only slight decreases in South Asia, and increases in the number of people living in poverty in Sub-Saharan Africa. As the chart below shows, over the next 15 years, the bulk of the reduction in poverty is expected to occur in South Asia, leaving almost all the world’s extreme poor living in Sub-Saharan Africa. A major assumption underpinning these projections is that the distribution of economic growth across the income distribution remains constant. A recent World Bank working paper highlights that there will be significantly different outcomes for the proportion of people living in extreme poverty in 2030, depending on the distribution of growth across the income distribution. The paper shows that if the bottom 40% could grow two percentage points faster than the average, the proportion of people living in extreme poverty could fall below 3% of the world’s population by 2030. However, if the bottom 40% grows at two percentage points slower than the average, almost 10% of the world would remain in extreme poverty in 2030. While eliminating extreme poverty by 2030 would be an amazing milestone for humanity, it is important to keep in mind that development doesn’t stop there. The extreme poverty definition only provides a very limited snapshot of people’s standard of living through the lens of changes in consumption. In addition, even though there has been significant progress in reducing the number of people living below $1.25 a day, the majority of the developing world still live below $4 a day. Furthermore, if climate change and other global development challenges are not addressed in the coming decades, progress toward reducing extreme poverty could easily be reversed. Chris Hoy is a Research Officer at the Overseas Development Institute. 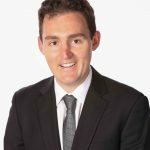 He has previously worked for UNICEF, AusAID and the Australian Treasury. He has a Masters in International and Development Economics from Yale University. Anyone who does analysis or predictions based on the World Bank’s $1.25 2005 PPP line inherits all of the flaws that go into that measure. One question is whether the line as such is drawn at a plausible level. That is, does it makes sense to say that a person on $1.26 2005 PPP is out of extreme poverty. It does not. One way to see this is to understand the method for setting the line. The World Bank simply averages the poverty lines of the world’s poorest countries. Another way to see this is to see what development outcome are like at the poverty line. David Woodward’s work on this problem is the best out there: http://www.neweconomics.org/publications/entry/how-poor-is-poor . A second question is what goes into making conversions between years and across currencies. Currently, the prices of all goods consumed are used to adjust for inflation and to convert to the base currency. This implausibly makes some goods that are totally out of the reach of poor people, such as flat screen tvs, relevant to determining poverty levels. It also thereby under-weights the effect price changes for goods which make up a larger portion of the budgets of the worst off, such as basic foodstuffs. Extreme poverty will not end from no where,the governments needs to find out the root cause upon poverty. The government itself may cause the situation to be more worse or a little bit good. And talking of the use of predictions based on the World Bank’s $1.25 per day as a sign of extreme poverty, i don’t think identifying that as a criteria for poverty measurement is a resolution, NO!. Governments and different development institutions or organizations should ask themselves as to ” why people are living under $1.25 per day?”. If they will be able to answer that question, its obvious that they will find causes and setting up of strategic solutions towards the problem, otherwise extreme poverty can never stop.